It’s time for spring cleaning, and the attic is the task at hand. You find twelve dusty, vintage school chairs stacked right at the front of a crowded damp space. They are scratched, dented and outdated, but they are wooden and strong; they’ve lasted the test of time. It is just impossible to throw them away. What on earth can you do? Keep reading. The creative solution Marijo Foster and Sarah Heller mustered up led to an entire semester of learning and functional creativity at The Lexington School. Blake’s course showed the importance of functional and up-cycled art pieces in our daily lives and gave a detailed “how to” of seeing the beauty in something thrown away. 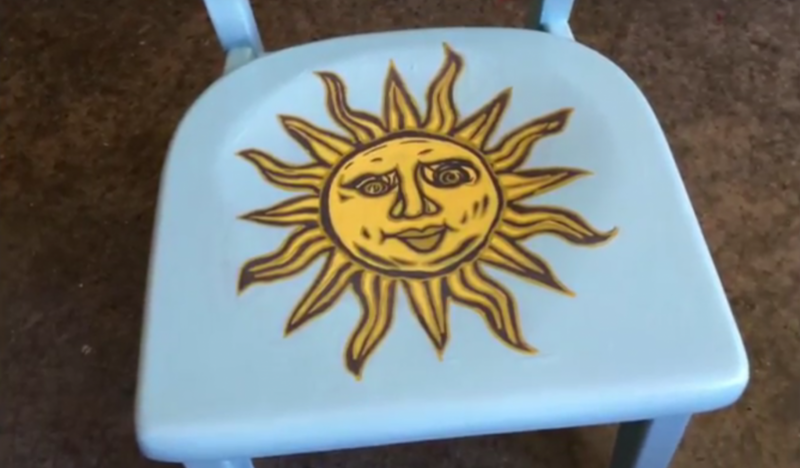 Thanks to Marijo Foster who kept them in her attic all these years, vintage TLS Kindergarten chairs were re-imagined and painted (harder work than you might think), and then marketed for The Lexington School’s CELEBRATION fundraising auction. Under Blake’s guidance, the students planned and executed the entire project, producing twelve beautiful works of art that will in turn benefit The Lexington School. Watch this video to see a two-minute synopsis of a most engaging student experience. Blake Snyder Eames, TLS class of 1986, is a professional artist who has exhibited her work in multiple venues for more than 20 years. Her paintings, design work, murals, and furniture pieces can be found in homes, businesses, and collections across the country. Her style is pop art infused and art deco inspired resulting in vibrant patterns that inspire the senses and soothe the mind’s desire for structure. Best known for her geometric paintings, Eames is also the owner of Blake Eames Design, an independent enterprise specializing in commercial and residential interior design and furniture redesign. Big thanks to Blake Eames, Marijo Foster, Sarah Heller, and of course The Simpson Arts Foundation for their collective (and functional) creativity. The Lexington School is a co-ed, independent, private school in Lexington, Kentucky that provides the highest quality education to children in preschool, elementary and middle school.